It’s an inescapable fact that banking is changing. A perfect storm has been created for the big bank following the 2008 global financial crisis which eroded consumer confidence. In addition technology and smartphones are providing new opportunities for FinTech businesses. Monzo went on to raise another £21m in funding and secure itself as a challenger bank while proving the concept of a community-owned digital bank. The new banking providers promise to put the customer at the centre of their business model. In contrast, a recent global PwC survey2 found that 61% of bankers thought a customer-centric business model is very important yet only 17% were very prepared for it. It is this disparity that challenger banks are capitalising on by offering improved services based on technological innovation – something traditional banks are struggling to adopt. The same PwC survey found that innovation within the industry was considered somewhat or very important by 87% of bankers, yet just 11% said their organisation was very prepared for it. So what might banking look like over the coming years? Machine learning isn’t new but it still hasn’t come of age. Essentially, they are still learning now to provide future benefits. One main benefit will be proactive assistance, not unhelpful hindsight. For instance, challenger banks already offer balance warnings and advice, not a notification that you’re already exceeded your overdraft. We’ll see these systems become smarter, using behavioral pattern analysis and predictive analytics to find ways to help us save money and prepare for potential financial situations we might find ourselves in. This should help customers save money, providing more capital for the new banks to operate with. We are already getting used to new forms of payment, such as contact-less cards and mobile payments. So, in a sense, the future is already here. Yet these systems still have lots of room for improvement. The future of payment systems may lie in biometrics. There are many biological features that make us unique as individuals. Even identical twins have different fingerprints, iris and blood vessel patterns, for example. These can be scanned and used to help secure our money without the need for PINs or cards, simplifying everything from purchases to online banking. Technologies like blockchain are enabling a quiet revolution – to enable more direct and transparent transactions between users. What started as peer-to-peer trading has morphed into complex networks backed by a digital ledger. Not only does blockchain cut out the middlemen, offering traditional financial services at a fraction of the cost, it can make financial transactions more transparent and secure. Technologies built on top of blockchain, such as Etherium, are enabling the use of digital smart-contracts which make it almost impossible for financial fraud, embezzlement and dodgy trading practices to continue. 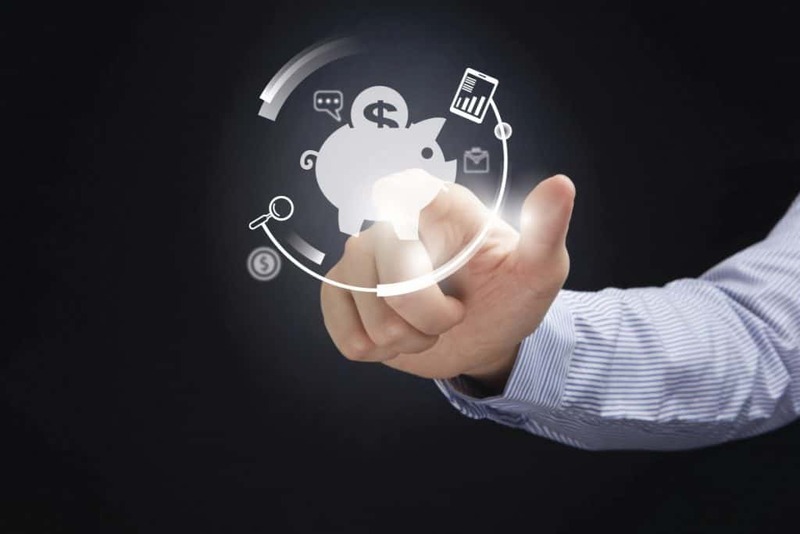 Ultimately, this technology can put users in charge of finance. We believe machine learning, data aggregation, blockchain and greater collaboration will converge – offering more individually tailored services. Combine that with ever-improving digital assistants and you end up with a network of smarter services that can use data to be more helpful to customers. We think AI assistants will be the new, personal face of these banking services. Augmented reality (AR) and virtual reality (VR) are becoming dominant in our lives. We might interact with people and businesses via VR, gain real-time information in AR, and seamlessly switch between the two. The technology will give you a visual understanding of your finances, where they are allocated, and what you need to save for in the future. An all round improvement. iBAN Online Limited is an Appointed Representative of Resolution Compliance Limited which is authorized and regulated by the Financial Conduct Authority (FRN. 574048). Marc Hurr and Daniel Eduardo Suero are co-founders of iBAN Wallet, a money management App that helps you control your finances, connects lenders and borrowers and facilitates the transfer of money between you and your friends. Visit the iBAN Wallet site to learn more. « How Does an Autonomous Vehicle Avoid Pedestrians and Other Obstacles?